For many people, the eldest ancestor of Chess is an Indian game for 4 players, 4-Handed Chaturanga, sometimes called Chaturaji (a Sanskrit word meaning "four Kings"). This game is depicted as a diced game where four teams of 8 pieces fight for a final victory. Simplistically, this game is supposed to illustrate a remote period when India was divided into several rival kingdoms, always at war. Later on, a wise man would have come and proposed to gather the pieces in two opposing teams. The extra King per side would have been given the role of a General, the dice would have been eliminated for a pure combination : Chess was born ! CAUTION : NOTHING CAN PROVE THIS THEORY! MOST LIKELY, THIS THEORY IS WRONG! If you are involved in teaching, writing, publishing, please stop copying this tale, get informed ! Sir Williams Jones (who first remarked the links between Indo-European idioms), reported in 1790 in his book "On the Indian Game of Chess", the tale saying that Chess had been invented by the wife of Ravan, king of Lanca (Ceylon), in order to amuse him while he was besieged in his city by Rama. This was happening in the "second age of the world", in the 4th millennium before Christ! His informant was the brahman Râdhakant who was referring to the Four-Handed Chess (which was played in India until the 19th century), apparently evoked in a Sanskrit text, the Bhavishya Purâna. However, Jones regarded the 4-Handed game as a modification of a primitive 2-Handed non-dice Chess. But this intituition was swept by Captain Hiram Cox, an English officier of the British East India Company, Governor of Bengal, who asserted in 1801 that it was 4H-Chess which was the seminal game and the 2-Handed game was a modification of it. Duncan Forbes, a British linguist, adopted Cox' idea in his The History of Chess published in 1860 where he developed the complete theory : a primitive 4-Handed dice-Chess was practiced first, and, from the difficulty of always finding four players, the game gradually became 2-Handed. Later on, the dice were abandoned, maybe under religious pressure. Forbes did not endorse the legend of Lanca, however he affirmed that 4H-Chess was described in the Bhavishya Purâna, a sacred text that he estimated to be 3000 or 5000 years old. This is the Cox-Forbes theory. However, the German indianist Prof. Albrecht Weber and the Dutch historian, Anton van der Linde, pointed out in 1874 that the Bhavishya Purâna was not that old and that they most probably contained no reference to Chess (which was confirmed few years later when these Sanskrit text became available to European scholars). This was too hard to believe for authors like Edward Falkener (1892) who was convinced of a very great antiquity. Also, the famous American ethnologist Stewart Culin made his personal hypothesis (1898) that the respective apparition order of board-games in mankind history should have been : race game for 2, then race game for 4, then chess for 4 and, finally, chess for 2. (He had no fact to sustain this theory which appears somewhat artificial today). Having doubts, the American Professor Willard Fiske wrote in 1900: "Before the seventh century of our era, the existence of Chess in any land is not demonstrable by a single shred of contemporary or trustworthy documentary evidence... Down to that date, it is all impenetrable darkness." The final word went to the great historian Harold James Ruthen Murray who cleared the question in his never surpassed monument : A History of Chess, more than 900 pages of erudition published in 1913. He demonstrated that the use of dice were never forbidden or discouraged for religious reasons in India where, on the contrary, representation of gods and goddesses playing are numerous. Relying on Weber's work, Murray confirmed that the Bhavishya Purâna (composed at the earliest on the 3rd century B.C.) nor any other Purâna contains any reference to Chess.
" the silence of all other Sanskrit works before 600 A.D. makes Râdhakant's assertion improbable in the highest degree". Concerning Culin's argument about Chess coming from an evolution of a race game, Murray revised it politely and, finally, wrote that definitive sentence (p50): "I find this hypothesis incredible". Three Indian texts refer to the passage cited by Jones and Forbes. It has been demonstrated that the three of them go back to same sources, two Bengalese texts from the late 15th or early 16th century: Raghunandana's Tithitattva and Shûlapâni's Chaturangadîpikâ (both being contemporary and linked if not copied). Forbes was then really wrong. All details on which all modern description rely are then about 500 years old only. It remains that the earliest account of this 4 Handed Chess is an Arabic work, the Tahqiq ma li l-Hind, a travel account in India by the famous Persian poet al-Bêrûnî, written circa 1030. (Al-Bêrûnî was born at Khiva in 973, lived at Hyrcania on the shore of the Caspian see and died in 1048). His rules are not always clear. Most of the details we know come from Raghunandana. After al-Bêrûnî, there are two Indian texts mentioning the 4-Handed Chaturanga which are older than the Tithitattva: Someshvara's Mânasollâsa circa 1110 and Kalhana's Rajatarangini, a metrical chronique of the Kings of Kashmir, dated 1148-9. However, those mentions are very short. Someshvara III was a prince of South-West India. His text is much more detailed for the regular 2-Handed Chess, showing that 4-Handed Chess was a mere variant at his time. To be exhaustive, there is maybe an other testimony to this game and it comes from ... Spain! Indeed, the Libro de los juegos, a codex composed in 1283, attributed to Alfonso X, King of Castille, mentions a "Four Seasons Chess" with similar rules, although not exactly. This game also used dice. In short, the earliest reference for a 4-Handed Chess comes from the 11st century only whereas the earliest mention of 2-Handed Chess is dated from early 7th century, so more than 400 years before! Then, the oldest reference for this 4-Handed game is 1030 only. In the 11st century, the 4-Handed appears to have been known and practiced in India only. If it had been the ancestor of the 2-Handed form, it will have yet to be explained why it was not transmitted to other neighboring peoples and why all sources, literal or archaeological, are silent before, over such a long period of more than 400 years. It is true that Indians did not pay much attention in writing the rules of their games as the Persians or the Arabs did. There are a small number of Sanskrit texts which mention Chaturanga in India before 1000, but none clearly state what was the number of players. Again, we find more information in a foreign source : al-Adli, an Arabic master who wrote about 840. He gave the difference between the rules and play of Chess in India versus the ones he knew. He gave them in deep details, and his observation always concerned 2-Handed Chess. He never mentioned any game for 4 players. We can safely conclude that al-Adli was not aware of any 4-Handed Chess in India. If it existed, it escaped his attention, which would be surprising. The fact that the 4-Handed Chaturanga makes use of dice has been often emphasized to assess its great antiquity. However, this is not a sound argument at all. In those mediaeval times, Chess was not that model of pure combination that it is today. The game was slow, maybe was it a little boring. Old times masters were more attracted by theoretical problems (openings, endings) than real plays. Playing with chance was not a shame, it represented destiny. The success of games like Nard (kind of Backgammon), Pachisi, Chapur and many other Indian games are here to testify that. Nard was at its summum of popularity in India between the 7th and 10th centuries, and the Indian cruciform race games (Pachisi, Chaupur) could been invented at the same period. Then, it is not surprising that a game for 4 were more appreciated with the help of dice to add some drama into the play. In addition, it should be insisted that Chess and dice were not incompatible. Muslims played Oblong Chess (over a 4x16 board) with dice, dice were often used in medieval Europe as an alternative of the regular play (for instance in Huon de Bordeaux, a French romance from the 13th century, or in the Alfonso X's Libro de los Juegos in 1283. On the opposite, when the Mânasollâsa mentions 4-Handed Chess, it is said that this game is played without dice. Therefore, there is no exclusive relation between 4-Handed Chess and dice, and playing with Chess with dice is not a character of a greater antiquity. Another original aspect of 4-Handed Chaturanga has been put forward, again to assess his antiquity: the use of Ships instead of Chariots and their switched positions with the Elephants, here placed at the corners of the board. 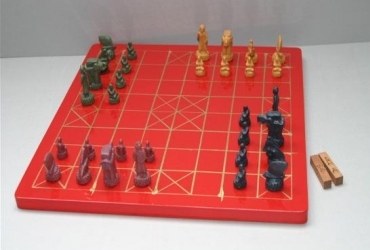 However, placing Elephants in the corner and the piece with the Rook move close to the King is merely the reflect of Chess habits in India and is in complete line with the situation of 2-Handed Chaturanga. The use of Ship (Nauka) is only accounted in Raghunandana's Tithitattva which comes not before late 15th. Al-Bêrûnî had a Chariot (Rook). This is probably a consequence of the use of Arabic style piece were the Rook was depicted with a large "V" slot, which could be interpreted as a boat shape. Nauka has been often used later, in Bengal especially (the Tithitattva is written in Bengali by the way). 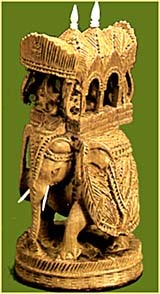 The use of Ship is also effective in 2-Handed Chess in Bengal (as well as in Thailand, Cambodia and Java). Finally, it is worth to point out that there is a true attraction in India for 4 players games. It would be interesting to search if this can explained the birth of Pachisi from Nard which might be contemporary of the apparition of Four-Handed Chaturanga in the last centuries of the first millennium. Even after years of researches in the field of history of Chess, I am sometimes surprised of how big can be the trouble for some people to read what I present on this page. Some people refuse to believe the facts I present (it is their absolute right) for many reasons: because they knew that the seminal Chess was 4-Handed and diced from long time, because they read it somewhere in a book, a newspaper or on the www or anywhere else. Some have also esoterical reasons based on what they believe to be ancient philosophy, magic of number 4, ... this kind of things. Then, sometimes, I'm getting e-mails. They are not always nice. I am OK to answer any request from someone not familiar with the field and having questions or wanting to clear something. I am OK to discuss with more specialized readers wanting to go deeper into the matter. If you have or know any elements I would ignore, I would love to learn this. Who knows, if a 4-Handed Chess is clearly mentionned somewhere in the 6th or 7th century, I'm ready to completely revise my judgement. But be aware that I'm looking for facts, historical or scientific. I am not OK to discuss with people who are just in search of some recognition and take pleasure to attack me with irony or mockery not supported by serious elements. I am not OK to discuss with people showing no respect. Those will not be answered. It is sad that such people exist. En matière d�Histoire, les contrevérités ont la vie dure. Chacun sait que bien des épisodes historiques se présentent sous une forme conventionnelle, souvent romancée, largement passée dans le savoir collectif, et une forme mieux informée mais malheureusement plus confidentielle. L�histoire du jeu d�échecs n�échappe pas, hélas, à cette règle. Un point particulier m�irrite très souvent et je voudrais lui porter ici un grand coup (tout en restant conscient que je n�aurai probablement pas sa peau) : non, non et non, il est impossible d�affirmer que le jeu d�échecs dérive d�un jeu à quatre joueurs ! Et tout laisse même à penser qu�il n�en n�est rien. Car, pour beaucoup de gens cultivés, l'ancêtre le plus ancien des échecs opposaient quatre joueurs qui déplaçaient leur huit pièces d�après le tirage d�un dé. On lit encore que ce jeu se pratiquait dans l�Inde ancienne, aux premiers siècles de notre ère et qu�on l�appelait chaturanga, d�un mot sanscrit portant la racine quatre (chatur). De manière simpliste, ce jeu était supposé illustrer une lointaine période où l'Inde était divisée en plusieurs royaumes rivaux, toujours en guerre. Plus tard, un sage, peut-être persan, aurait proposé de regrouper les pièces en deux camps adverses. Le Roi en excès dans chaque camp aurait pris le rôle d�un Général, les dés auraient été éliminés pour un jeu de pures combinaisons : les vrais échecs étaient nés ! Ce tableau brosse une histoire très séduisante. Simple, compréhensible et véhiculant un bon sens implacable. Avec son triomphe de la raison sur le hasard, elle est si plaisante qu'elle apparaît dans un grand nombre de revues ou de livres traitant des échecs, chaque fois qu�une introduction historique est nécessaire. Plus inquiétant encore, elle se trouve maintenant largement répandue et copiée sur des centaines de pages à travers tout Internet. Mais hélas, cette théorie est très certainement fausse ! Il est vraiment regrettable que, le plus souvent par ignorance, des livres, des articles de journaux et des sites web parfois sérieux et respectables (par exemple celui de la Bibliothèque nationale de France) continuent de propager ce conte simpliste. De grâce, si vous êtes impliqué dans l'enseignement, dans l'écriture ou dans l'édition, ne recopiez plus cette histoire sans vous informer ! Sir Williams Jones (1746-1794), orientaliste anglais, fut un brillant linguiste, l'un des premiers à souligner les similitudes entre les langues européennes, le persan et le sanskrit. En 1790, dans son livre On the Indian Game of Chess, il expliqua le sens du mot chaturanga comme les quatre membres de l�armée épique indienne et évoqua un chaturanga pour quatre joueurs, le chaturâjî (1), alors joué en Inde (il y était encore pratiqué au XIXe siècle) qui auraient figuré dans un texte sacré sanskrit, le Bhavishya Purâna. Un brahmane du nom de Râdhakant lui avait confié que ce jeu aurait été inventé, pendant le « second âge du monde » par l�épouse de Râvana, roi de Lankâ, capitale de Ceylan, afin de le distraire lors du siège de leur ville par le dieu Râma. Toutefois, Jones doutait et tenait ce jeu quadripartite pour une modification d�un jeu d'échecs primitif à deux sans dé. Jones avait là une bonne intuition mais elle fut balayée par le Capitaine Hiram Cox, un officier anglais de la British East India Company, promu gouverneur du Bengale, qui prétendit en 1801 dans On the Burmha Game of Chess, adressée à la très respectable Asiatic Society, que c�était au contraire le jeu à quatre qui représentait le plus vieil ancêtre et que le chaturanga à deux en dérivait. Plus tard, en 1860, le linguiste britannique Duncan Forbes repris l�idée de Cox et la développa sous la forme d�une théorie complète dans son livre The History of Chess : le premier jeu d�échecs inventé se jouait à quatre joueurs et à l�aide de dés. Ce jeu serait progressivement devenu un jeu à deux, principalement à cause de la difficulté à réunir quatre protagonistes. Selon Forbes, les dés auraient été abandonnés, probablement sous la pression religieuse. Le linguiste ne poussait pas aussi loin que le siège de Lankâ, mais, voulait croire que les règles du jeu à quatre mains figuraient dans le Bhavishya Purâna, texte qu�il estimait vieux de 5000 ans environ. Toutefois, l�indianiste allemand Albrecht Weber et l�historien néerlandais Anton van der Linde démontrèrent en 1874 que les textes du Bhavishya Purâna ne pouvaient pas être aussi anciens et que, selon toute vraisemblance, ils ne contenaient aucune mention des échecs. Malgré tout, cela n�entamait pas la confiance d�un auteur comme le célèbre ethnologue américain et spécialiste des jeux Stewart Culin qui, en 1898, formula l�hypothèse toute théorique que l�ordre d�apparition des jeux de plateaux dans l�histoire de l�humanité devait être respectivement : 1) les jeux de parcours pour deux joueurs, 2) les jeux de parcours pour quatre joueurs, 3) les échecs pour quatre joueurs et finalement 4) les échecs pour deux. Pris de doute, le professeur américain Willard Fiske écrivit en 1900 : « Avant le viie siècle de notre ère, il est impossible de démontrer l�existence des échecs, dans n�importe quel pays, par la moindre évidence documentaire de confiance. Avant cette date, tout n�est qu�obscurité impénétrable ». Le mot de la fin revint au grand historien anglais Harold James Ruthven Murray qui clarifia la question dans son oeuvre monumentale toujours inégalée : A History of Chess, plus de 900 pages de très grande érudition, publié en 1913. Il démontra que l�usage des dés ne fut jamais proscrit par les religions en Inde, où, au contraire, les représentations de divinités y jouant sont nombreuses. S�appuyant sur les travaux de Weber, Murray confirma que le Bhavishya Purâna (composé au plus tôt au IIIe siècle av. J.-C. et qui n'était pas accessible aux études européennes avant la fin du xixe siècle) ni aucun autre Purâna ne contiennent de passages sur les échecs. Il conclut que (p.49) : « le silence de tous les autres travaux sanskrits avant 600 apr. J.-C. rend l'assertion de Râdhakant improbable au plus haut point ». Quant à admettre que les échecs dérivaient d'un jeu de parcours, comme l�affirmait Culin, Murray démontra que cette idée ne reposait sur rien de tangible, et finit par la balayer avec cette phrase définitive (p.50) : « Je trouve cette hypothèse impossible à croire ». La théorie dite « Cox-Forbes » venait d�être démolie. En réalité, trois textes indiens font allusion au passage cité par Jones et Forbes. Tous trois puisent dans les mêmes sources : deux textes bengalis de la fin du xve ou début du XVIe siècle, le Tithitattva de Raghunandana et le Chaturangadîpikâ de Shûlapâni. Forbes se trompait donc lourdement. Les détails, sur lesquels toutes les descriptions modernes s�appuient datent donc de 500 ans à peine et le plus ancien témoignage pour ce chaturâjî demeure un manuscrit arabe, le Tahqîq mâ li-l-Hind, un récit de voyage au Nord de l�Inde, écrit par le persan al-Bîrûnî vers 1030. Toutefois les règles qu'il donne ne sont pas toujours claires. Ensuite, deux textes indiens font une allusion très brève au chaturâjî, le Mânasollâsa de Someshvara III, un prince du Sud-Ouest, écrit au début du xiie siècle (mais qui attache beaucoup plus d�importance au chaturanga pour deux), et le Râjataranginî de Kalhana, une chronique des rois du Cachemire, datée de 1149. Pour être complet, il existe peut-être même un autre témoignage pour ce jeu et ce témoignage provient� d�Espagne ! En effet, le Libro de los juegos, un codex de 1283, attribué au roi de Castille, Alphonse X le Sage, fait état d�un jeu d�échecs « des quatre saisons » aux règles à peine différentes. Cette variante aussi se joue à quatre et avec l�emploi de dés. On sait que cet ouvrage a largement puisé dans les �uvres arabes. Une influence indienne, transmise par le biais du savoir musulman, n�aurait rien de surprenant. Si on récapitule, la plus ancienne référence pour le jeu à quatre provient du XIe siècle seulement, alors que la première mention écrite des échecs à deux, date du début du VIIe siècle, soit 400 ans auparavant. Au XIe siècle, le jeu à quatre n'est attesté qu'en Inde. S'il avait été l'ancêtre du jeu à deux, il faudrait alors expliquer pourquoi il n'aurait pas été transmis aux peuples voisins et pourquoi aucune source, écrite ou archéologique, ne l�a jamais mentionné auparavant. Il est vrai que les Indiens ne prêtaient pas beaucoup d'attention à l'écriture des règles de leurs jeux, à la différence des Arabes ou des Persans. Une petite poignée de textes sanskrits mentionnent un chaturanga au Cachemire avant l'an 1000, mais aucun ne spécifie clairement combien de joueurs y prenaient part (2). En revanche, al-�Adlî, un maître arabe qui écrivait vers 840 à la cour des califes abbassides, témoigna des différences entre les règles arabes et indiennes de son temps. Son récit s�arrêta sur plusieurs détails, mais il concernait toujours le jeu d�échecs pour deux joueurs. Il ne mentionna jamais aucun jeu à quatre alors qu�il se montra curieux de présenter toutes les variations qui pouvaient exister sur les règles. Si le chaturâjî se pratiquait dès son époque, cela lui aurait donc échappé, ce qui semble improbable. Le fait que le chaturâjî utilisait des dés fut aussi parfois souligné pour démontrer une plus grande antiquité. Pourtant, cela ne constitue pas un argument probant. Dans l�Orient ancien, le hasard dans les jeux symbolisait la destinée, l�intervention divine. A ce titre, jouer avec les dés n�avait rien de méprisant, au contraire. Ainsi, les Arabes jouaient aux échecs oblongs, une variante sur un échiquier de 4x16 cases, avec deux dés au IXe siècle, soit bien avant que le chaturâjî soit attesté. Même les Européens ont continué d�utiliser les dés pour choisir leurs coups aux échecs standards jusqu�au XIIIe siècle au moins (par exemple dans Huon de Bordeaux, une romance française, ou dans le Libro de los Juegos du roi Alphonse X de Castille). D�autre part lorsque le Mânasollâsa évoque les échecs à quatre, il les décrit comme un jeu sans dés, ce qui finit de démontrer qu�il convient d�écarter toute relation entre les échecs à quatre et les échecs aux dés. L�un n�implique pas l�autre. Les défenseurs de la primauté du chaturâjî mettent encore un autre argument en avant : l�utilisation de Bateaux (nauka) à la place des Chariots et leur position intervertie avec les éléphants, dans ce cas placés aux coins de l'échiquier. Pourtant, il ne s'agit là que d'une habitude courante en Inde, que l'on retrouve aussi, avec parfois une grande confusion, dans la position des échecs indiens à deux joueurs à toutes les époques. Et puis même, l'utilisation d'un Bateau ne se rencontre que dans les règles bengalies du XVe siècle (par exemple, dans le Tithitattva). Pour al-Bîrûnî, la pièce jouant le rôle de la Tour moderne était bien un Chariot. L�assimilation en Navire pourrait provenir de l'utilisation de pièces de style arabe où la Tour est représentée avec une large entaille en V sur le sommet, un trait qui peut évoquer la coque d'un bateau. Il est curieux de constater que l�usage d�un Bateau au sein des pièces d�échecs est resté au Bengale, mais aussi en Thaïlande, au Cambodge et à Java. Il reste qu�il a existé, et qu�il existe peut-être encore, une vraie attirance dans le sous-continent indien pour les jeux de plateau à quatre joueurs. Dans le domaine des jeux de parcours, les Indiens possèdent la famille du pachisi et du chaupur, ancêtre des Petits chevaux de notre enfance (3). Le chaturâjî représente la manifestation de cette inclinaison dans le domaine des échecs. C�est un jeu clairement indien, mais aucun élément historique ne permet de dire qu�il a précédé toute forme d�échecs à deux joueurs. Tout concourt à penser que ces échecs à quatre constituent une variante du jeu à deux et non le contraire. C�était l�opinion de Murray au début du siècle passé, et elle reste toujours la plus plausible. 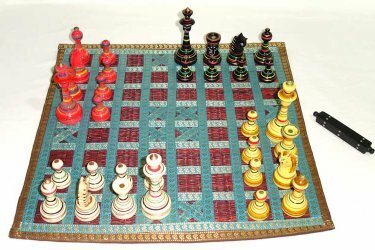 Non, le jeu d�échecs ne dérive pas d�un jeu à quatre joueurs ! (1): Le nom chaturanga désignait aussi le jeu d�échecs à deux joueurs en Inde. Ce mot sanskrit signifie exactement « quatre membres » et renvoie aux quatre composantes de l�armée épique indienne : cavalerie, éléphants, chars de guerre et infanterie. Jones proposa d�employer le mot chaturâjî, signifiant « quatre rois » et désignant une combinaison particulière, pour nommer le jeu à quatre joueurs afin de le distinguer de la variété à deux. (2): Il s�agit du Haravijaya (La victoire de Shiva) de Ratnâkara (vers 850), du Kâvyâlamkâra (Les ornements de la poésie) du poète Rudrata (vers 900) et du Mritasañjîvinî de Halâyudha (vers 970). Le Nitivakyamurta, composé vers l�an mil, évoquait, lui, sans équivoque, le jeu à deux et non pas à quatre. (3): Ces jeux pourraient dériver d�une adaptation pour quatre joueurs d�un jeu du type backgammon, alors pratiqué en Inde, et leur apparition pourrait se trouver contemporaine de celle du chaturâjî. Il serait alors intéressant de chercher si l�histoire de ces jeux quadrumanes présente un point commun.